One of the most common pollen allergies is Parietaria allergy. Parietaria allergy refers to an allergic reaction to the pollen of one or more species of the Parietaria genus in the nettle family. Parietaria allergy commonly causes symptoms such as itchy throat sensation, coughing, laryngospasms, difficulty talking and breathing, low blood pressure and, in some cases, anaphylactic shock. 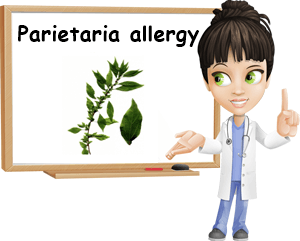 The best course of treatment for Parietaria allergy is avoiding the allergen and having access to adequate allergy medication prescribed by a doctor. What is Parietaria? As mentioned above, Parietaria is a genus of plants in the nettle family. They are flowering plants and can be found in temperate and warm regions all over the world. What does Parietaria look like? The different species in the genus share common characteristics. Parietaria plants may reach up to 1 meter in height and have green, pink or rhubarb-colored, hairy, upright stems. They have simple, dark green leaves, lance-shaped, pointed at the end and set alternately on the stems. Depending on the species, they produce small, white, green, pink or red-brown flowers grouped in clusters. The flowers do not have petals and are attached to the stems. Parietaria species are presently listed as weeds and tend to be invasive in the areas they are native to or naturalized. More important, they flower continuously from spring till late autumn and produce significant amounts of highly irritating pollen which would explain the high incidence of allergic reactions to parietaria. Parietaria species were once used for medicinal purposes. Parietaria officinalis in particular was commonly used for making diuretic, expectorant, emollient and soothing preparations. The root was used for toothaches. Its leaves and flowers are a source of important antioxidants like kaempferol and quercetin. However, all Parietaria produce important amounts of pollen, making them unsafe for use in preparations because of the high risk of causing allergic reactions. 1) Parietaria officinalis, wall pellitory or lichtwort, the most common species. 2) Parietaria judaica, pellitory of the wall, found in Europe, Asia, Australia. 3) Parietaria debilis, native to New Zealand and Australia. 4) Parietaria floridana, or Florida pellitory. 5) Parietaria pensylvanica, or Pennsylvania pellitory. 6) Parietaria praetermissa, in southeastern United States. 7) Parietaria lusitanica, in southern Europe, particularly Italy and Spain. 8) Parietaria cretica, spread throughout the Mediterranean region. 9) Parietaria mauritanica, common in southern Europe. All of the above-listed species have a strongly allergenic pollen. Parietaria officinalis, judaica, cretica and lusitanica are the source of most cases of Parietaria allergy in the Mediterranean region. In the United States, Parietaria officinalis, floridana and pensylvanica are commonly the source of allergic reactions. Any type of Parietaria pollen can cause severe allergic reactions. 1) Sneezing and runny nose, stuffy nose. 2) Itchy ears and ear fullness with impaired hearing. 3) Throat itching and hoarseness, irritated vocal cords, laryngospasm. 4) Wheezing, coughing, shortness of breath. 5) Allergic conjunctivitis, itchy, watery eyes. 6) Eczema or hives where the pollen comes into contact with the skin. 7) Airways narrow and breathing is obstructed. 8) Low blood pressure, lightheadedness. 10) In severe cases, anaphylactic shock. 1) Avoid the allergy source by avoiding going where Parietaria may grow. 2) Drink water in small sips to wash away the Parietaria pollen from your airways and inactivate it. 3) Wash you face with water. If possible, wash hair too to remove pollen. 4) Pollen sticks to clothes, so change clothes immediately. 5) If you experience laryngospasms, drink some water. Read more about laryngospasms. 6) If you are known to have asthma attacks, use the medication your doctor gave you. Ventolin inhalers are commonly prescribed for asthma and need to be carried on you at all times. 7) Avoid going out of the house on windy, dry days or extremely hot weather. Conclusion. The best treatment for Parietaria and other allergies is prevention. First of all, this means avoiding the allergy trigger. Next, avoid going out on dry, wind days because wind transports pollen far making it easier to cause an allergic reaction. If you are in your car, it’s best to turn on your air conditioning than drive with the window open. Also, never leave your house or work immediately after a light rain because the rain breaks pollen particles in even smaller pieces that rise in the air easier and may affect allergy sufferers. Lastly, carry your medication and water with you at all times.